Here is another photograph from my own collection. 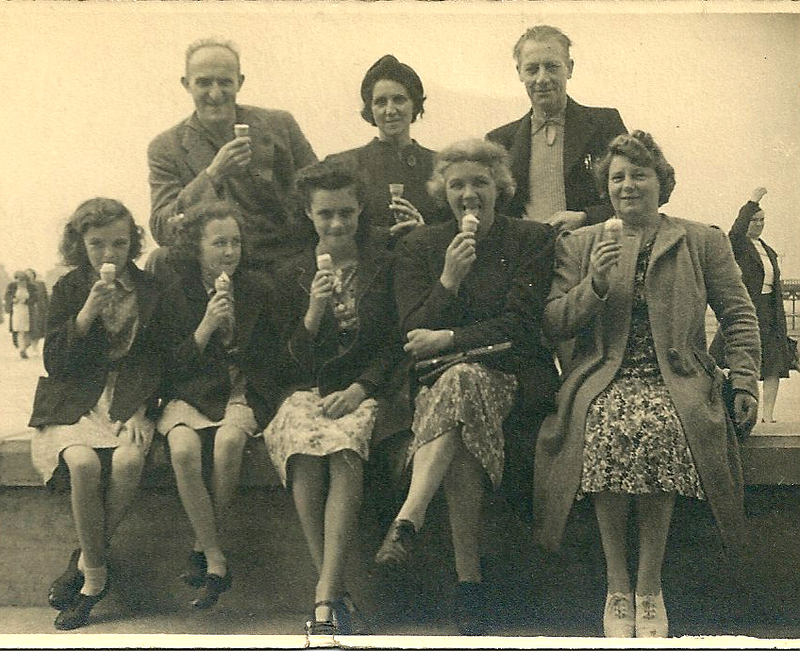 I don’t know who the people are but they are clearly enjoying their ice creams – probably at the seaside. Given that I have inherited the photograph along with many others from my grandparents I guess that someone in the picture, or all of them may well be my relatives. I think that the photograph looks to be taken perhaps in the 1950’s or very early 1960’s. Sunday Snap – Nurse or Maid? This is another photograph from my own collection. Continuing a theme that I seem to have been following recently it is another group image. 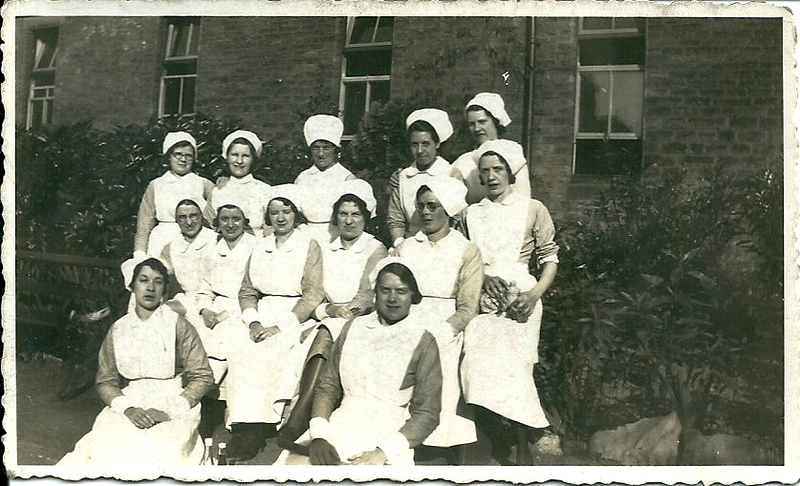 When I first looked at the photograph I was convinced they were nurses, possibly in the grounds of the hospital where they worked. The more I have studied the image I am less certain. I now wonder if they could be domestic servants – house maids, kitchen maids and cooks. I have a couple of other photographs of this same group and although you can’t make it out very well the woman front right is holding a tennis racket. I suppose it is possible that hospital’s had tennis courts but I think it is unlikely. I’ve seen my mum today and she can’t shed any light on the photograph at all. We have plenty of domestic servants in our family tree so I am assuming that perhaps one of the people is an ancestor. But as with many of the photographs in my collection it will probably forever remain a mystery. As piece of social history maybe my descendants might find it as interesting as I do. Summer holidays when I was a young boy were taken at British seaside resorts. We regularly went to Blackpool and Cleethorpes for a week. I also recall going to Great Yarmouth and Scarborough. We stayed in a traditional seaside guesthouse for bed, breakfast, dinner and evening meal. So a typical day – depending on weather – would include time on the beach, donkey rides, going to amusement arcades, rides at the Pleasure Beach or fun fair, and wandering around the town. In the evening parents might go to see a show at the theatre. I have memories of my dad taking me / us to a local cafe for a mug of Horlicks before bedtime. 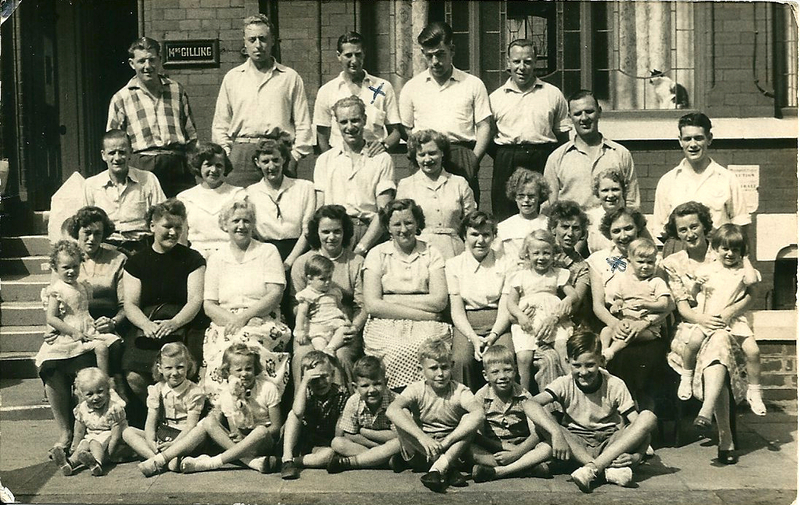 On this one I am sat with my mum – second from the right (marked with a x). My dad is on the back row – again marked with a x. On this next one I am stood in the middle in front of my mum. My grandma is next to us but I don’t who the young lad is in front of her. My granddad is third from left on the back row and my dad fifth from the left. I don’t know for sure where either photograph was taken – I’m sure my mum might remember if I ask her. I think we went to Great Yarmouth with my grandparents so I guess the photograph just above could be from that holiday. 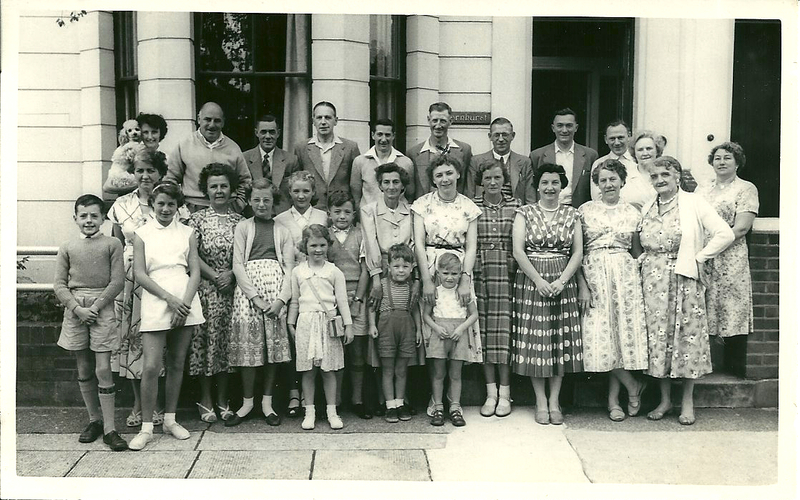 Does anyone else have similar memories of going on holiday and having a group photograph taken at the end of the week? Sunday Snap – Railway Posers? 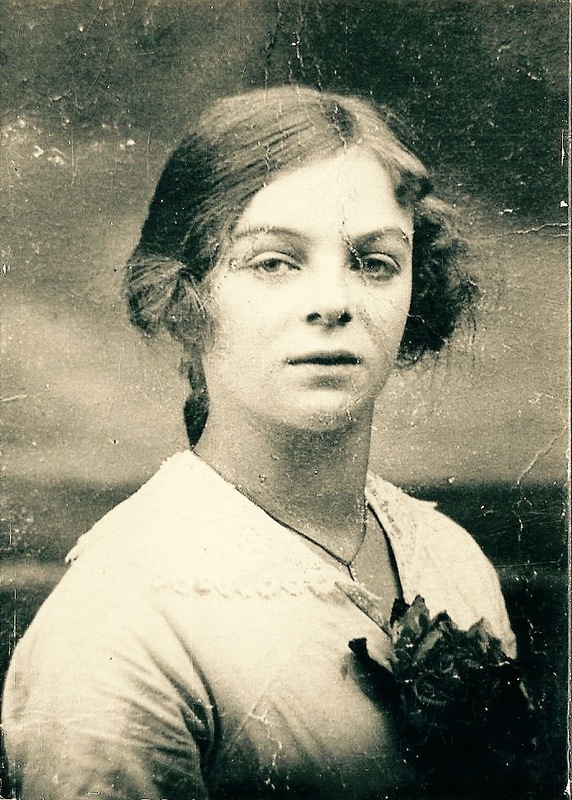 This is a photograph from my own collection – yet another of the many unidentified subjects. Across the bottom right corner is the name Bruce Johnston, Keighley. I can find a couple of references to this firm of photographers on local family history message boards. The chaps in the photograph are obviously in some sort of uniform. I think that there are some clues that suggest they are railway workers. I can read the initials MR on the cap of the man on the right of the photograph. I suspect that this is the Midland Railway company. 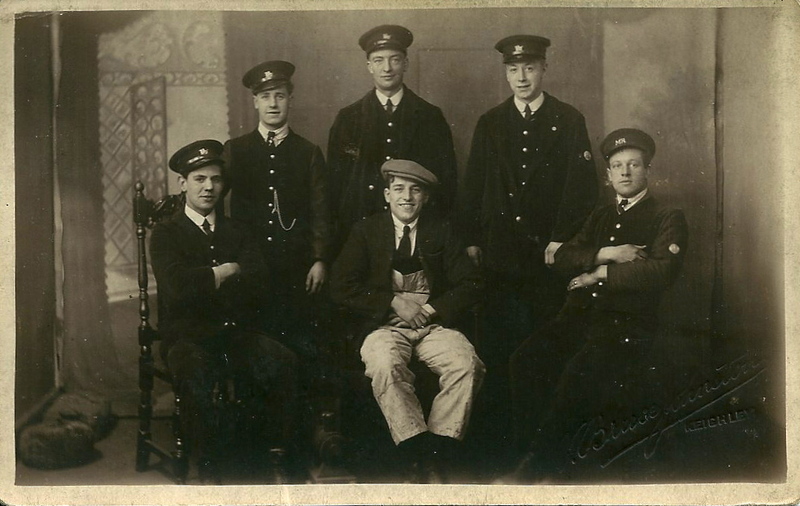 The visible pocket watch chain worn by the man second left indicates to me that he is probably a railway worker. I don’t recognise anyone in the photograph. However my grandfather, Joseph Dawson, worked for London, Midland & Scottish Railway company and may well have worked for the predecessor the Midland Railway company. I am really hopeless at trying to date photographs. But if there is a connection with my grandfather I guess it would have been taken around the 1920 period and before MR became LMS. If anyone has any other suggestion I would be happy to hear it. Given that this year we might see some street parties to celebrate the Queens Diamond Jubilee I thought I post a photograph from my own collection. I have no idea what the celebration is – perhaps the Coronation in 1953; perhaps VE Day, although I think it looks later than that; or perhaps it was some local celebration. Whatever the occasion I hope that they had a good day. 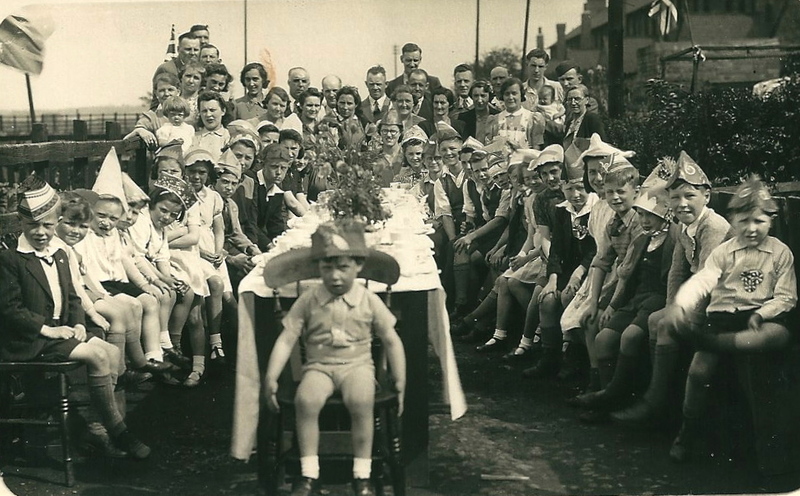 Certainly some of the people in the photograph seem happy to be there but others do look a bit miserable. I have tried to examine it closely to see if I recognise anyone. And to be honest I’m not sure. There is a lady on there with a look of my grandmother – think I need to ask my mum if she knows anything at all about the picture. If anyone has any suggestions about the period or event please leave a comment. This is a photograph of my dad, Graham Dawson, taken sometime in the late 1940’s or early 1950’s. It is taken at one of two locations and I can’t be sure which one it is. 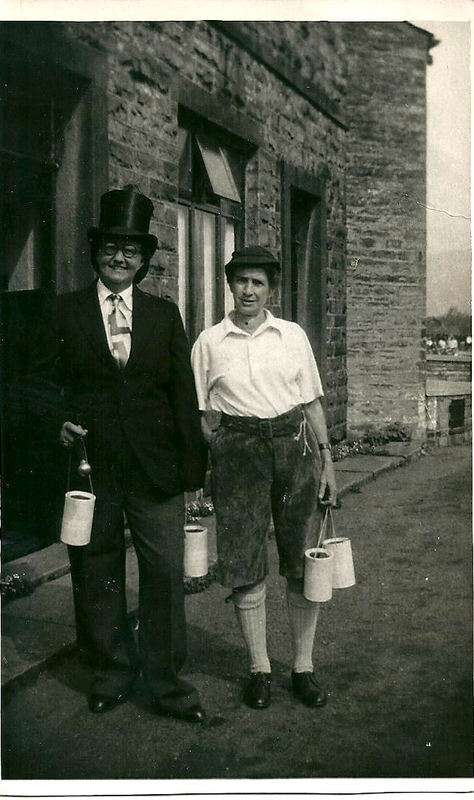 My dad met my mother (Alice Musgrove) when he lived and worked in Clitheroe, Lancashire. 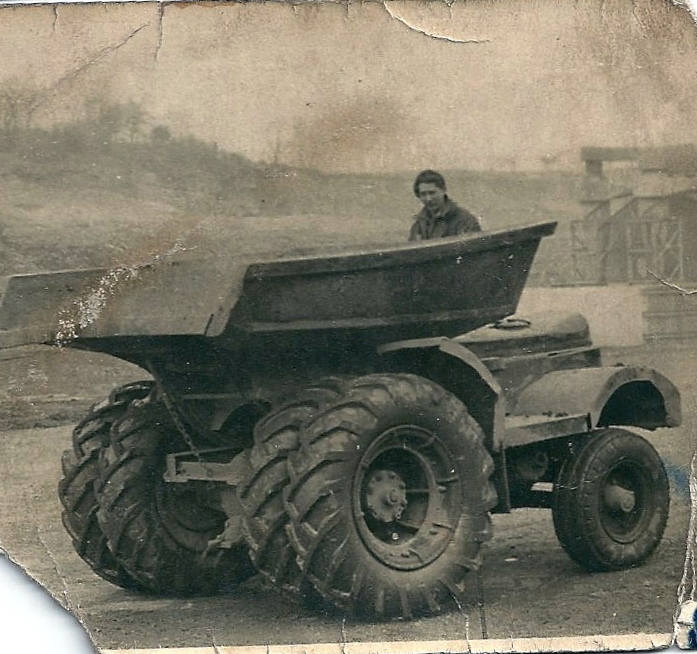 He was employed for a time at the local quarry where he was a “dumper” driver. My mother tells the story that my dad named his “dumper” Alice – I’m sure that must have been out of some sort of affection for her (my mother that is). The other possibility is that the photograph was taken when he worked at the Barnbow site in Leeds. I don’t know what his job was but I understand that he drove a “dumper” there as well. Barnbow was originally built as a munitions factory during the First World War – this is quite apt as we have just been to see a preview showing of the film War Horse which is set during WW1.